The movie Ronin is a thriller about a group of former soldiers and intelligence operatives hired to seize a mysterious suitcase. The two primary characters are Sam and Vincent, played by Robert De Niro and Jean Reno, respectively. The movie was filmed mostly on location throughout France, in Paris, Arles and other locations in Provence. Let's visit some of those locations. The movie opens with a shot of the Basilique du Sacré-Cœur in the Montmartre district of Paris. The viewpoint then lowers to show Rue Drevet, running down from the butte of Montmartre through the 18th Arrondisement. Rue Drevet is just three blocks long, from its upper end where it tees into Rue Gabrielle to its bottom end where it turns nearly a right angle into Rue la Vieuville, leading toward the Abbesses Métro Station. 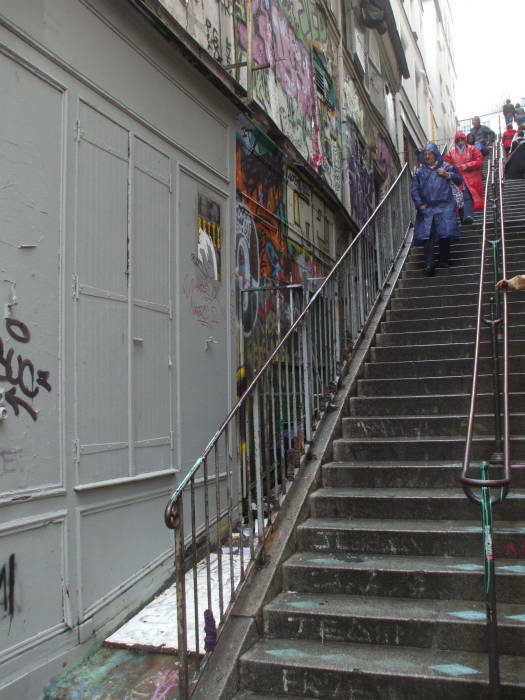 The middle third of Rue Drevet is a steep staircase, from Rue André Barsacq down to Rue des 3 Frères. A café once known as the Blue Sky at the bottom of the staircase is the setting of the opening and closing scenes of the film. One character walks down in the opening, another walks up in the closing. 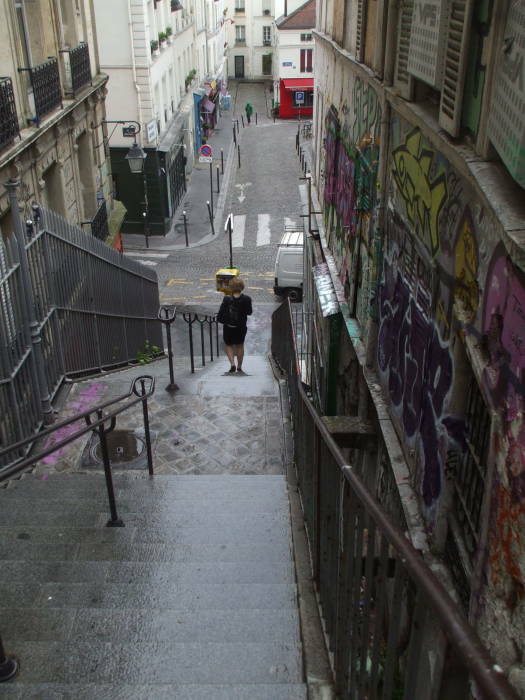 Here we watch almost over the shoulder of Sam (Robert De Niro) as he looks down the staircase of Rue Drevet toward Rue des 3 Frères and the café Blue Sky. Satisfied that it is reasonably safe to continue, Sam moves down the stairs toward the café Blue Sky. 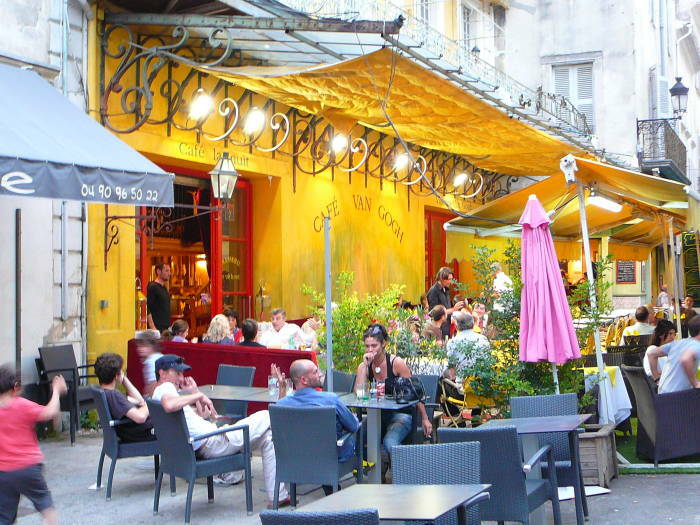 Vincent (Jean Reno) then walks up Rue Drevet and crosses Rue des 3 Frères, approaching the café Blue Sky. There is a very clever edit cutting from a shot of Vincent walking on the street in Paris to a shot of him walking into a set of the café. Here we see Jean Reno crossing Rue des 3 Frères and passing a woman and a man (seen only as a shadow here). There are a very few dark frames as Vincent seems to pass behind the couple and reappear. But there has been a cut to this shot done on a set. We follow Vincent and watch over his shoulder as he enters the set of the café Blue Sky. The scene then cuts back to Sam continuing down the staircase, stopping and looking into the café windows. I don't know if this shot is a composite or if the actual doors and windows were used. 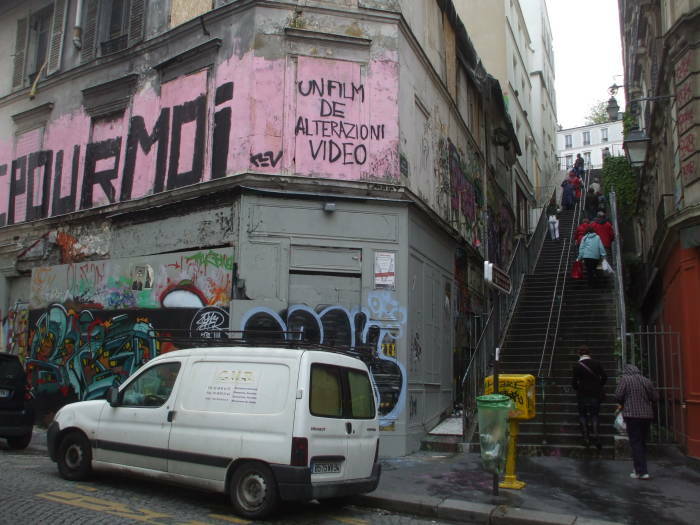 We don't see clearly into the café in the shots also showing the stairs of Rue Drevet. Here we are standing in the intersection of Rue Drevet and Rue des 3 Frères, looking up the staircase of Rue Drevet with the former Blue Sky at left. The staircase and associated fencing and building structure is quite recognizable, as seen from below and above. 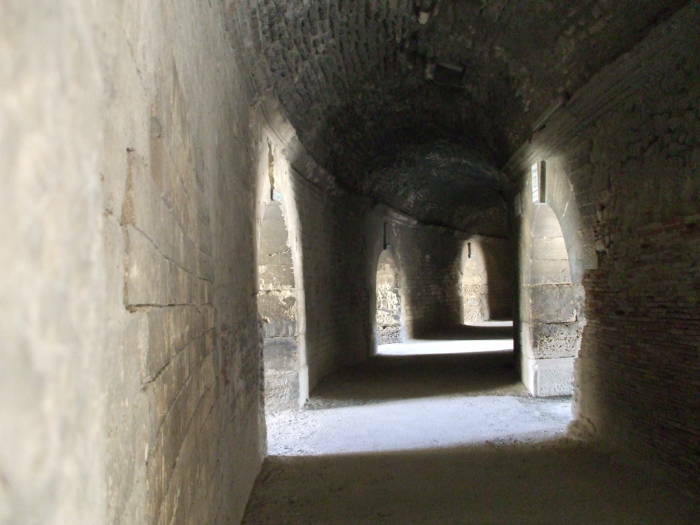 However, if you were to go around either side of the base of the staircase, passing through the narrow locked gates, you would not find yourself in a large tunnel-like underground passage leading to the back of the café and a back alley. 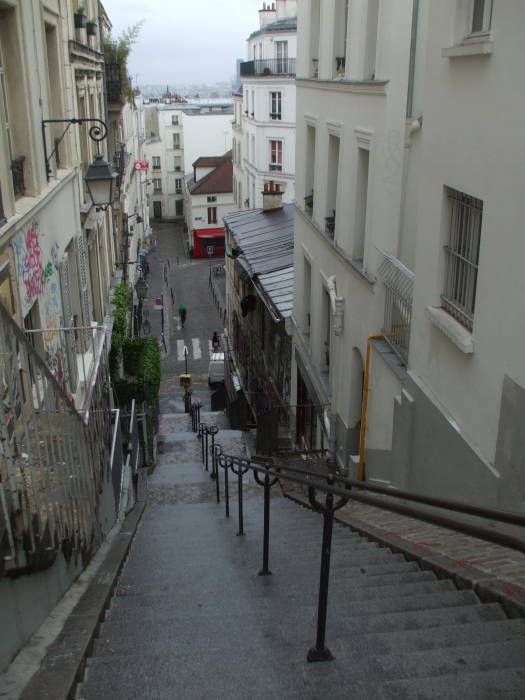 That direction simply leads into the bulk of the steep hill of Montmartre. The cafe site itself has had its windows boarded up and the main entrance closed off with concrete blocks! During the movie there is a short dialogue as Sam and Vincent wait and watch in a parked car. 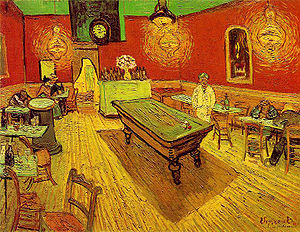 The last scene of the movie shows Vincent and Sam in the café. Sam leaves in a car, Vincent walks up the staircase. He says to himself, as narration: "No questions. No answers. That's the business we're in. You just accept it and move on. Maybe that's lesson number three." The Pont Alexandre III bridge spans the Seine near Place Concorde. The bridge was built in 1896-1900. It was named after Russian Tsar Alexander III, who had concluded the Franco-Russian Alliance in 1892. His son, Tsar Nicholas II, the last Russian Tsar, laid the foundation stone in October, 1896. It's a six-meter high single span steel arch. "Alexandre" versus "Alexander"? That's the French versus English spelling of the Russian name Александр. 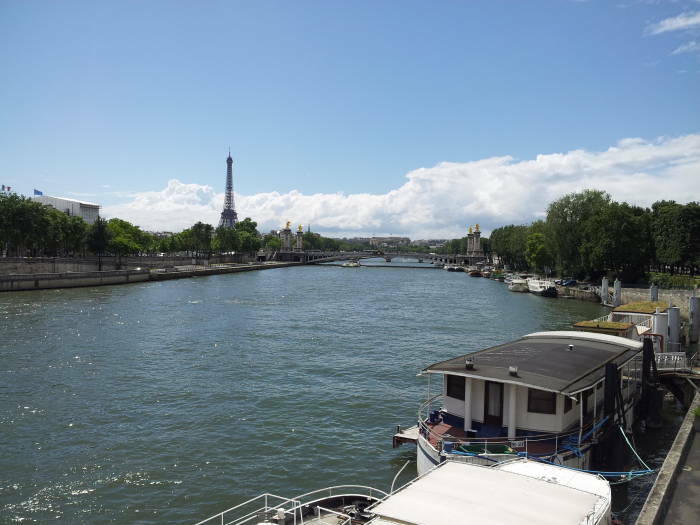 In this view we looking downriver, west, toward Pont Alexander III while standing on Pont de la Concorde. The Eiffel Tower is visible beyond its left end. In the movie, our group of ronin carry out an arms deal under the bridge on the Right Bank, to our right in this view. Arles is on the lower Rhône river. Several scenes in Ronin were filmed on location here. The city was close to the Rhône's mouth in ancient times, but the coastline has moved further away as the Camargue delta has filled in. 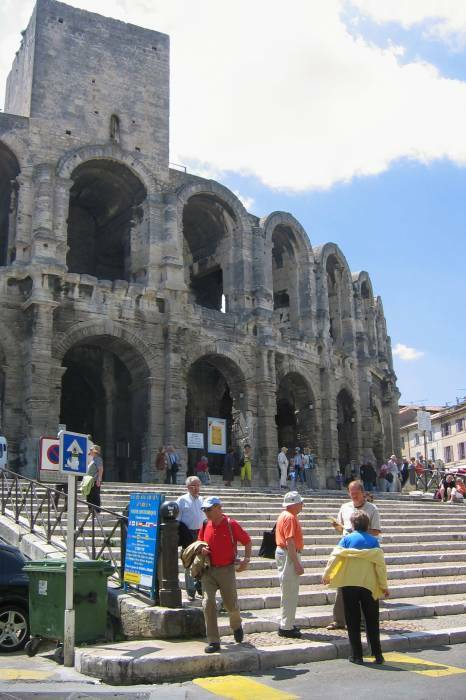 The site of Arles was first settled by the Ligurian people around 800 BC. The Celts had some influence on the area. The settlement then became a major Phoenician trading port, as it was still close to the Mediterranean coast. This aerial shot establishing the movie's shift to Arles shows the Amphitheatre in the old Roman core of the city along the Rhône. The Romans took control of the city and port in 123 BC. They called it Arelate and expanded it into a major port city, building the first bridge across the Rhône (the modern bridge crossing in that location is still the southernmost bridge across the Rhône), improving the port, and digging a canal paralleling the Rhône so the port had access to the Mediterranean independent of the sometimes flooding and dangerous river. Despite these improvements, it was clearly second place to its nearby neighbor of Massalia, the port city originally settled as a Greek colony and now known as Marseille. Arelate's big break came when it took Julius Caesar's side and provided military support in his fight with Pompey. Caesar was victorious and Massalia had backed Pompey, so Massalia was sacked and its wealth transferred to Arelate. The city was then designated a military retirement community for Legio VI Ferrata. It was officially titled Colonia Iulia Paterna Arelatensium Sextanorum, meaning that it was the Julian Colony of Arelate for the Soldiers of the Sixth Legion. Sort of like Fayettenam, North Carolina I suppose. The Colosseum in Rome had been built in 72-80 AD. Arelate finished its equivalent, known as the Amphitheatre, a decade later in the year 90. 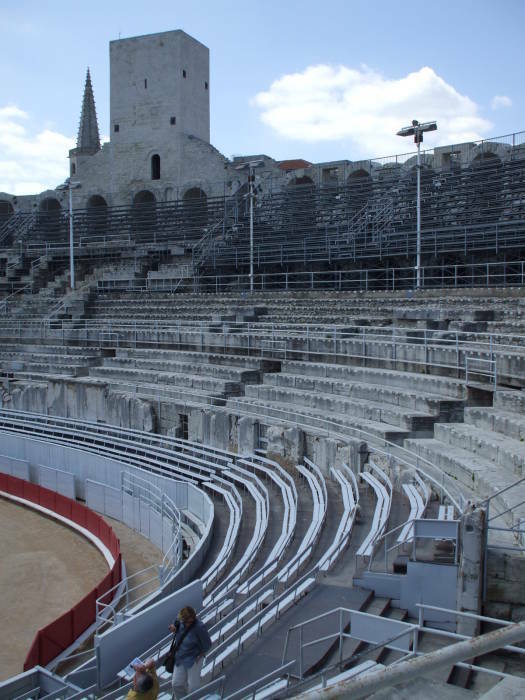 The Arelate Amphitheatre could seat 20,000 for entertainment including chariot races and gladiatorial battles. The Amphitheatre is large, 136 meters long and 109 meters wide, with two levels of 120 arches each around its exterior. Arelate was one of Emperor Constantine's favorite cities — after, of course, his own Constantinople. 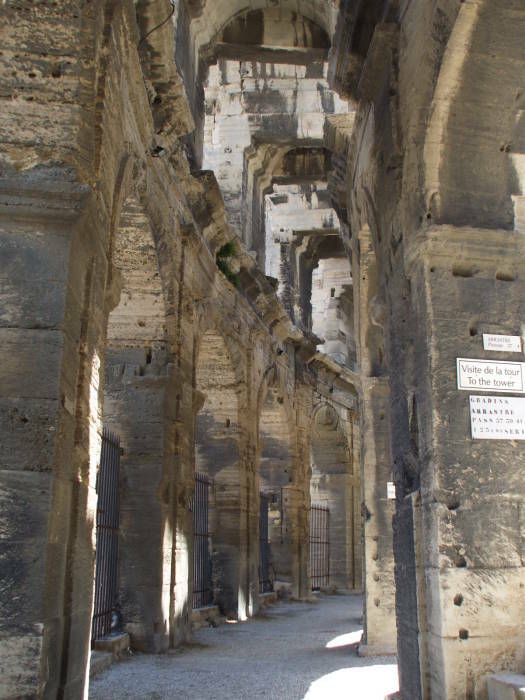 He built some elaborate baths, remains of which can be seen, and his son and successor Constantine II was born here. Arelate reached the peak of its power and influence in the 4th and 5th centuries, when Roman emperors were using it as a base for military campaigns in western Europe. At the same time Rome and the western Empire was fading away, while the Eastern or Byzantine Empire was still in its ascendency. Gladiators were housed in some of the galleries around the lower levels. The gladiatorial contests went on for four centuries. As the western Roman Empire faded away, the city became known prominent as a religious center in the Christianization of Gaul. Secular political power had shifted to the Visigothic kings, while the bishops were strictly Roman Catholic. By 385 in the nearby town of Treves this led Priscillian to the unfortunate distinction of being the first Christian to be burned at the stake by other Christians for practicing the wrong specific form of Christianity. He was a follower of the Arian interpretation of the true nature of Christ, and therefore was killed for this heresy. Later in the movie, our intrepid band of mercenaries have split up, and there is a violent confrontation in the Amphitheatre. Later in history, on the other hand, Rome was well on its way to fading completely away by the 400s. No more chariot races or gladitor fights to the death, and people started moving into the Amphitheatre and converting it to a residential fortress. The Muslim Saracens invaded and then the Franks drove them out and seized control of Provence in the late 700s. 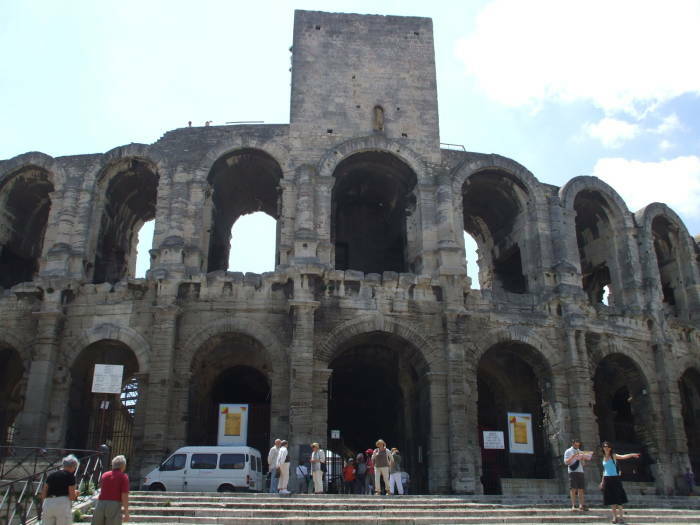 The Frankish Kingdom of Arles was established with its capital here in 855. Then came a series of attacks by Saracen and Viking raiders. The Amphitheatre continued to be converted to a fortress, eventually with 200 houses and two churches built within it. One church was on the public square at the center of the arena, the other at be base of the western tower. Pieces of the Kingdom of Arles ware incorporated into the Kingdom of France, nibbling away at its territory from the 900s through the 1100s. It came under the control of a count in 1239, and was back to being overshadowed by nearby Marseille. The Kingdom of Arles disappeared, no longer even the mere formality on paper that it had been, in 1378 when the Holy Roman Emperor Charles IV gave the Kingdom of Arles to the Dauphin of France, who later became King Charles VI of France. The Amphitheatre continued as a largely residential fortress through the 1700s. But in 1825 a move began to restore it to its role as natinoal historical monument. The houses started being town down in 1826, and in 1830 it held the first public since Roman times. This was a bull race celebrating the capture of Algiers. Today they hold Courses Camarguaises or Provençal-style bullfights. The bull is not killed in these, a team of men attempt to remove tassles from the bulls' horns without getting injured. At Easter and on the first weekend in September they hold Corridas or Spanish-style bullfights in which the bulls are killed. They also have an encierro or bull-run through the streets before each fight. The railroad system had arrived in the 1800s, gradually ending much of the river-based trade and decreasing Arles' economic importance. The city became less prosperous and therefore less expensive, and this was just fine with artists like Vincent van Gogh, who arrived in Arles in February of 1888. Van Gogh loved the colors and the light of southern France, which he viewed as an exotic, distant and somewhat dangerous land after growing up in the Netherlands and then living in Paris for two years. He seems to have had a dream of establishing a utopian community of artists in Arles. He was visited by a number of other artists, and eventually persuaded Paul Gauguin to share his rented room above the Café de la Gare. He was using the adjacent Yellow House as his home and studio at the time, he converted some of it into living space. Eventually, on October 23rd, he convinced Gauguin to move in. 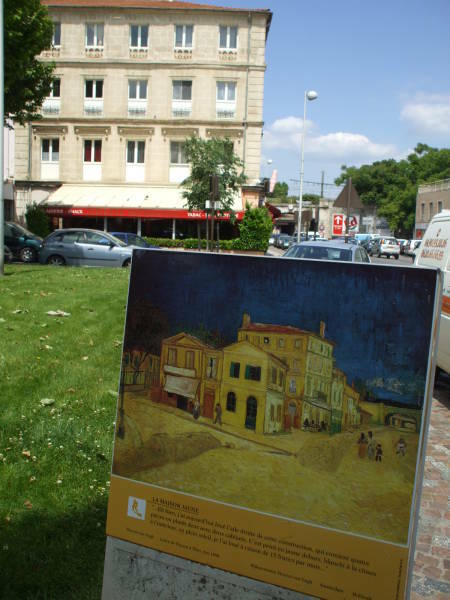 Above you see a reproduction of his painting The Yellow House, showing the house on the corner with a small grocery shop to its left and the Café de la Gare to its right. The kitchen and atalier or artist's workshop were on the ground floor. The bedrooms were behind the two windows on the first floor, Van Gogh's on the left and Gauguin's on the right, at the corner of the building. 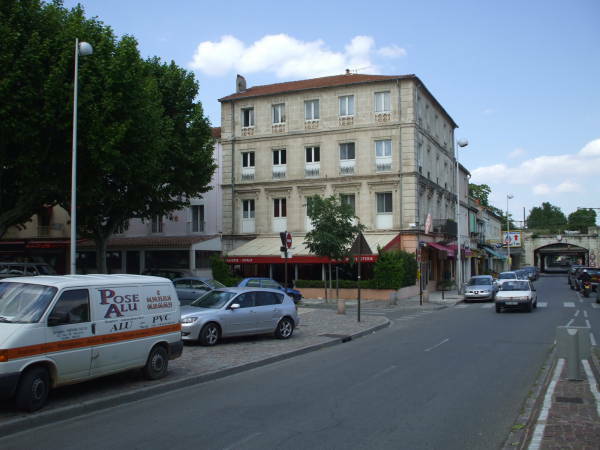 The area facing on Place Lamartine was heavily damaged during World War II, and the buildings were torn down soon after the war. The large four-story building on the corner has taken the place of the Yellow House. This next picture is taken from near where the painting was made, with the same view down the street through the railroad bridges. There wasn't much there immediately before the war. Only fellow artists and some art critics and dealers knew of Van Gogh when he was alive. Retrospective exhibits in the 1900s and 1910s increased public awareness until his pieces were some of the most recognizable works of art by the middle of the 20th century. But meanwhile his old home had been heavily modified before the war destroyed it. Today I am probably going to begin on the interior of the café where I have a room, by gas light, in the evening. 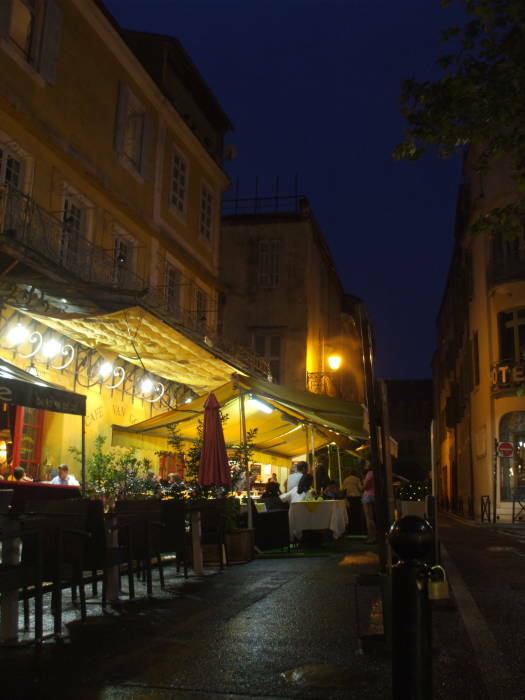 It is what they call here a "café de nuit" (they are fairly frequent here), staying open all night. "Night prowlers" can take refuge there when they have no money to pay for a lodging, or are too drunk to be taken in. I have tried to express the idea that the café is a place where one can ruin oneself, go mad, or commit a crime. 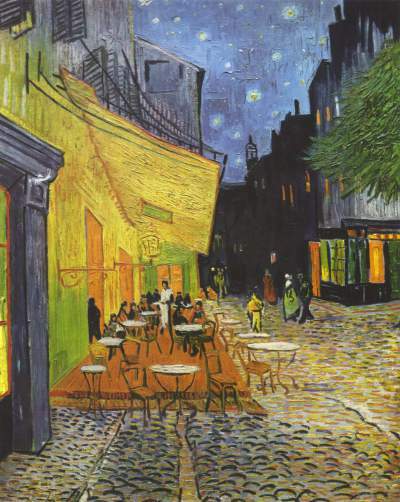 Another Arles location Van Gogh famously depicted was a coffeeshop on the Place du Forum. There is still a café there, in 1990-1991 they renovated it to closely resemble its appearance in the late 1880s and renamed it Café Van Gogh. Seamus O'Rourke, a representative of the IRA trying to get the mysterious piece of luggage, passes through the Place du Forum and past the front of the café. There is another steel easel in Place du Forum with a reproduction of the painting very close to where Van Gogh set up his easel. 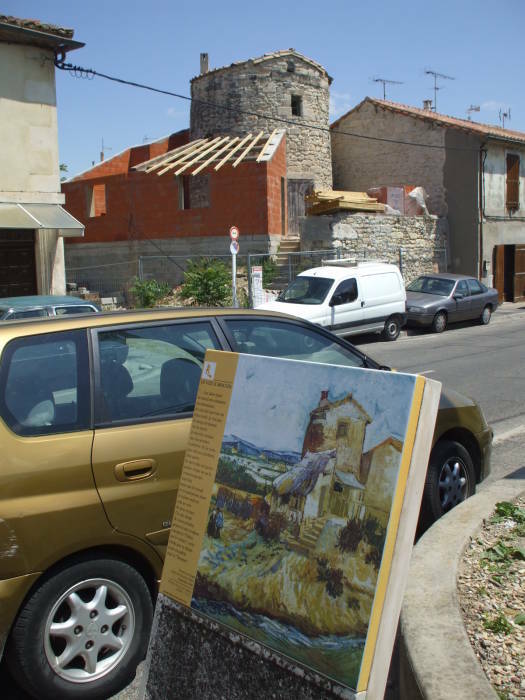 There are several of these around Arles, and in some cases like Le Vieux Moulin they are restoring some of the view to what he saw. The utopian artist's colony did not work out. Van Gogh and Paul Gauguin worked together through November, after Gauguin's arrival in late October. Van Gogh admired Gauguin, but Gauguin was arrogant. They argued fiercely. On December 23rd, exactly two months after Gauguin's arrival, Van Gogh confronted Guaguin with a straight razor. Then Van Gogh panicked and fled to a local brothel he frequented on Rue du Bout d'Aeles. He cut off his left ear with the razor, wrapped it in a newspaper and handed it to a prostitute named Rachel, telling her to "keep this object carefully." He staggered back to the Yellow House and collapsed, where Gauguin later found him lying unconscious. Van Gogh was taken to a local hospital where he remained for several days, continually asking to see Gauguin. His state is worse, he wants to sleep with the patients, chases the nurses, and washes himself in the coal bucket. That is to say, he continues the biblical mortifications. Van Gogh returned home to the Yellow House in January of 1889, but through February he was back and forth between home and the hospital, suffering from hallucinations and delusions that he was being poisoned. A group of thirty people in the community organized a petition demanding that the fou roux or the redheaded madman be confined for everyone's safety. The police closed his house in March and Van Gogh moved in with a physician. In May, Van Gogh committed himself to the hospital at the former monastery of Saint Paul-de-Mausole in Saint-Rémy, about 30 kilometers from Arles beyond Les Baux-de-Provence in the direction of Avignon. During a little over a year in Arles, Vincent van Gogh had produced around 300 works of art, many of them now well known throughout the world. His year in the hospital at Saint-Rémy was similarly productive. Getting back to the movie, there was a razor slashing, this one fatal, and Sam has suffered a bullet wound. Vincent takes him to a friend's home outside Les Baux-de-Provence. 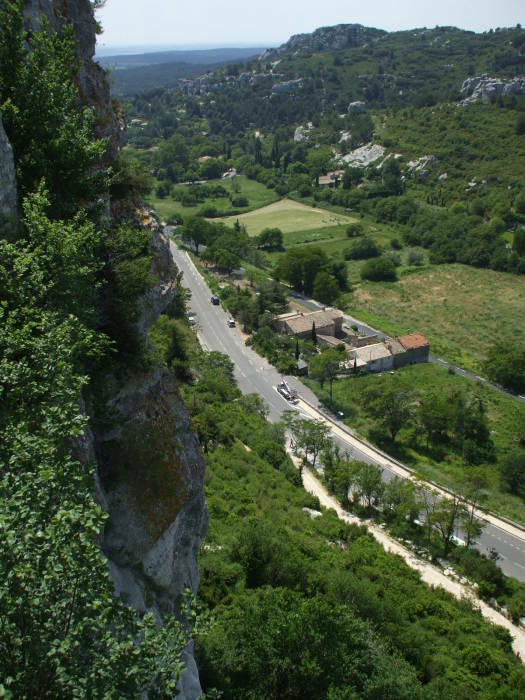 The terrain is very rugged, in the small Alpilles mountain chain. The town is on top of a rocky outcrop, its name is based on the Provençal word bauç, referring to a rocky spur. This was where a geologist in 1821 first recognized the aluminum ore consisting mostly of gibbsite or Al(OH)3, boehmite or γ-AlO(OH), and diaspore or α-AlO(OH), mixed with some clay, iron oxides and other minerals. The ore takes its name, bauxite, from the location. The site has been settled as far back as 6000 BC, and was used by the Celts as a oppidum or hill fortress. In the Middle Ages it was the seat of a powerful feudal lordship controlling 79 towns and villages in the area. The feudal Lords of Baux claimed to be descended from Balthazar, one of the Three Magi, and tried to control all of Provence before being deposed in the 1100s. The Grimaldi family, the rulers of Monaco, were granted the town as a French marquisiate. A marquis is a nobleman of hereditary rank, who ranks below a duke, a title mostly restricted to members of the royal family. The county of a count is usually in the interior of a country, while the march of a marquis is on the border and therefore requires the marquis to defend against neighboring lands. 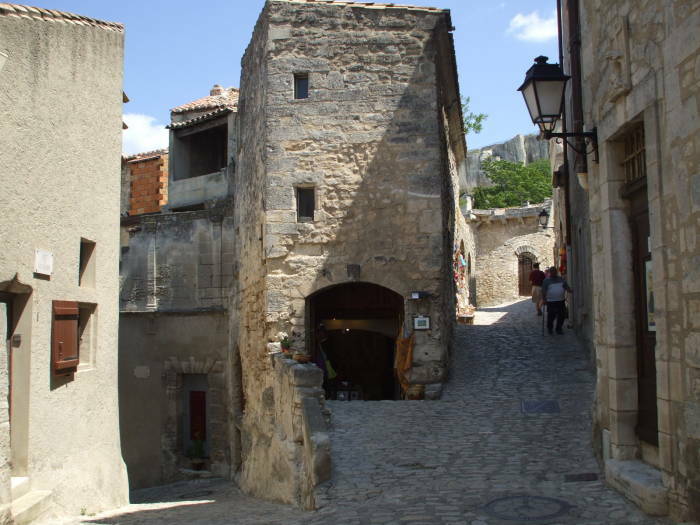 The page dedicated to Les Baux-de-Provence, Barbégal and St-Rémy-de-Provence has much more on Les Baux. Vincent's friend Jean-Pierre, keenly interested in military history, explains to Sam the story of the Forty-Seven Rōnin, which he is depicting in a very detailed diorama. Jean-Pierre: The Forty-Seven Rōnin. Do you know it? Jean-Pierre: Forty seven samurai, whose master was betrayed and killed by another lord. They became rōnin, masterless samurai, disgraced by another man's treachery. For three years they plotted, pretending to be thieves, mercenaries, even madmen. That I didn't have time to do, and then one night they struck, slipping into the castle of their lord's betrayer and killing him. Jean-Pierre: There's something more. All forty-seven of them committed seppuku, ritual suicide, in the courtyard of the castle.